Experience with being a gym leader: At the time of writting this im the Dark/Poison co-leader and as stated previous I have experience playing mono/dual type competitively. How long have you been playing Pokemon/Pixelmon? : I have only started in gen3 with Pokemon Saphire but I have played all the (true) pokemon games. Do you play Pokemon competitively? : Yep I play oftenly on the current gen via Wifi Battles and recently started playing Showdown on occasion, I also battle every now and then on the server and currently trying to wrap up my last 2 gyms for the Ace rank. How long can you play per day? : During the week from 3 to 4 hours, on the weekends I cant make a stabel schedule but 3 hours the very least. On a scale of 1-10, how would you rate yourself at competitive battling? : 6.5 I dont consider myself a really good player but I think im a decent ammount above an average player. Take in consideration I consider a 7.5 or above a high Elo player. Why should we pick you: It has come to my attention that Grass/Rock is in need of a co-leader and as such I decided to try and take on the role to help reduce downtime of the open gym. This is the team im open to any doubts people may have about why I picked a mon/move/EV spread etc. I would really appreciate feedback on the Tangrowth while im on the fence on having 2 AV users spagheti lord has saved me on a few situations, if you think off a better mon for that slot let me know(I would like to avoid Tapu Bulu). 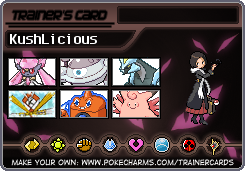 Updated the team based on recommendations by fellow gym leaders. The rock has a green light!